Historically, my role at holiday gatherings has been to provide the "Adult Beverage" (we have done Peppermint Martinis, Cranberry Tea Martinis, Pumpkin Pie Martinis...you get the picture). 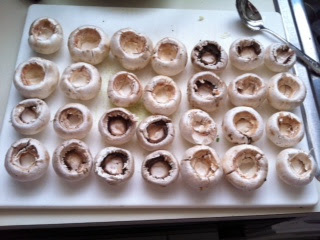 I had participated in other ways previously including bringing the cocktail meatballs (the fabulous Amy Sue's recipe) and one year the unfortunate turn out of HG's Peppermint Bark Fudge - but this year I was tasked with bringing the stuffed mushrooms. 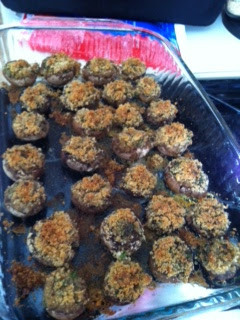 While I have eaten and enjoyed a variety of flavors of these golden stuffed morsels, never have I ever made a stuffed mushroom. SO this led me to the Food Network (obv). 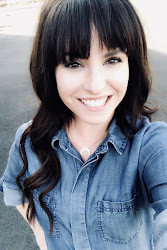 I came across Giada's recipe and it was perfect - easy (so I could make them Thursday morning before my trek to the castle) and ended up being so delicious! So, here we go. 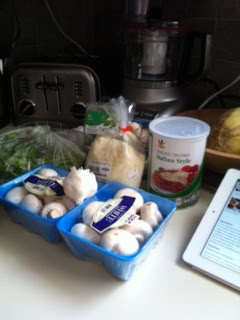 First, gather your ingredients (and ipad for instructions... shh don't tell tt). 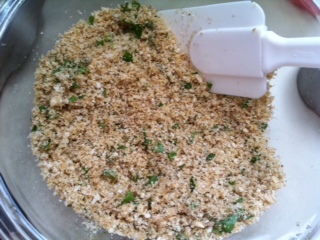 I used Stop and Shop brand breadcrumbs (when you flavor 'em up, no need to spend the extra money on brand name) and the Pecorino Romano that is in bags. 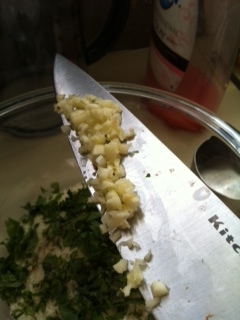 Next, add your minced garlic to the bowl. Add a little EVOO and stir to combine all these ingredients together. I had a little trouble "stemming" the little white mushrooms without breaking them. After going through a few test runs (thank goodness I got extra!) I finally got into the rhythm. I found the easiest way to do this was to use a spoon and gently wiggle the stems out. I tried to use the mushrooms that were all the closest in size. Fill the cavities (Missed this photo op!) and drizzle EVOO over the top, then bake. And Voila!~ when they come out they will look scrumptious and golden brown like this. Note: I did use a pyrex baking sheet instead of a cookie sheet... I did this mostly because I was transporting them to NY and this pyrex has an insulated carry case, so I thought it would keep them warm..I was wrong, but oh well. I turned the temp down to 375, and sprayed with PAM spray instead of using oil in the pan. 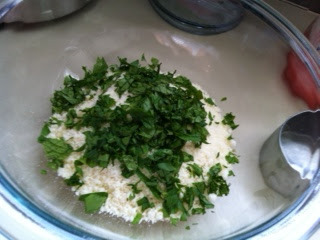 Stir the breadcrumbs, cheese, garlic, parsley, mint, S&P, and 2 Tbl EVOO in a medium bowl to blend.